Image caption A judge said Leighton Johnson had behaved "like a clown"
A football fan who gave a Nazi salute to Tottenham Hotspur supporters has been branded a "racist oaf" by a judge. Leighton Johnson, 43, made the offensive gesture at Liberty Stadium in April 2017 after Spurs scored two late goals against the Swans. Swansea Crown Court heard the salute was captured on video by a director from the London club, which has a long association with the Jewish community. Johnson, who pleaded not guilty, was given a 12-month community order. Spurs director Jon Reuben, who is Jewish, inadvertently caught the moment on his mobile phone while filming away fans and players celebrating the game's dramatic turnaround. Johnson, who denied causing racially aggravated alarm or distress, claimed he was waving to a family member about going for a cigarette. But during sentencing on Monday, Judge Paul Thomas QC described the defendant's account as laughable and said there could be no more offensive or vile gesture towards any religious group. Judge Thomas said: "Your behaviour was that of a racist oaf and you made a clown of yourself giving evidence during your trial. "You claim you were waving to invite someone to go for a cigarette and that you didn't know about the club's connection to Jewish fans. This to me is laughable." 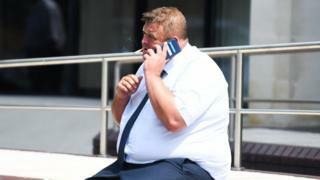 Johnson, of Swansea, was ordered to do 150 hours of unpaid work and pay £1,085 in costs. He was also banned from Swansea City home matches for the next three years.